If the only Caribbean dish you can name comes from 7-Eleven and rhymes with "chief chatty," oh boy, have you ever been missing out. From Trinidad to Barbados, Jamaica to Bermuda, the multi-ethnic tropical islands responsible for international treasure Rihanna are also famous for a whole mess of drool-inducing eats. Jerk chicken, curry chicken, oxtail, doubles, callaloo -- these dishes profoundly reflect the area's long, sorted history of colonization, reclamation, and cross-cultural exchange. Growing up with a Trinidadian grandmother, this was my childhood comfort food and just thinking about stew beef bubbling away on the stove makes my mouth water like I need an umbrella (ella, ella, eh, eh, eh). Avoid looking like a dopey Club Medder next time you roll through the roti shop by using this handy primer for all 'tings Caribbean cuisine. As the good people of Jamaica like to say, "Betta belly buss dan good food waste" -- which roughly translates to, "You best eat all your dinner or else." Odds are you've probably come across this aptly named allspice-habanero blend at some point in your culinary adventures. 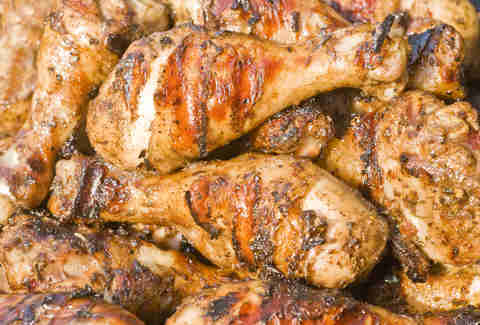 Wings, drumsticks, chicken breast, fish filets -- you name it, it tastes better doused in a heavy hand of Jamaica's favorite fiery, smoky seasoning. 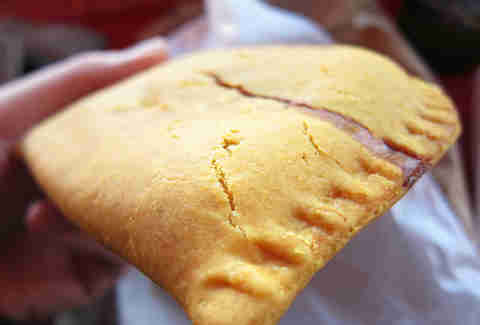 Also known as a "pinch-me-round," gizzada is a palm-sized Jamaican tart of Portuguese origin. It has a flaky, buttery shell, a pecan pie-like coconut filling, and limitless power over anyone who dares to enter its mesmerizing aroma zone. Roti is a type of soft, chewy flatbread, kind of like a cross between flour tortillas and Indian naan. In the Caribbean, this savory street food is most often eaten in the form of a wrap, loaded with either slow-roasted, meaty curries, fragrant vegetables, or a little of both. 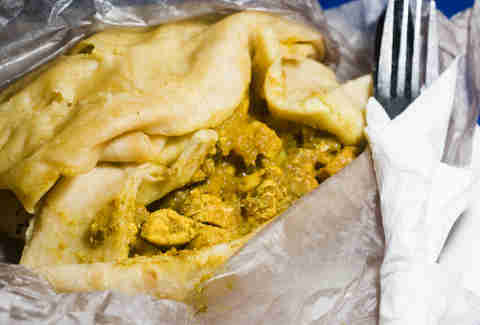 Another street food sent straight from the heavens, doubles are a breakfast staple in my ancestral land of Trinidad and Tobago. A pair of fluffy flatbread rounds are deep-fried, filled with channa (curried chickpeas), and then topped with condiments like mango chutney, cucumber slices, coconut flakes, tamarind sauce, or, my favorite, a vinegary hot pepper sauce native to the islands. OK, so ackee is this completely bizarro African fruit that's about the size of a pear, tastes like scrambled eggs, has a soft, lychee-esque texture, and looks like an alien brain attached to a giant black bean -- oh, and it can be super toxic if not handled properly. Because it eats way more like a veggie than a fruit, it's often found in savory fare like Jamaica's national dish, ackee and saltfish. 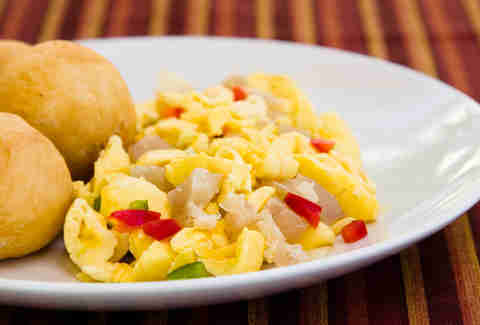 In this beloved meal, boiled ackee is sauteed with salt cod, onions, tomatoes, and scorching Scotch bonnet peppers, and served with dumplings, fried plantains, and/or rice and peas. 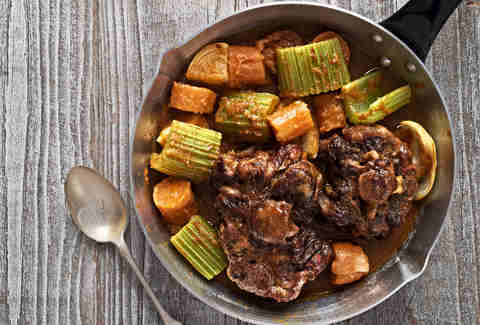 Stew beef is a one-pot, slow-cooked, soul-nourishing masterpiece of a meal, chock-full of hearty chunks of melt-in-your-mouth beef caramelized in brown sugar, onion, Worcestershire sauce, tomato, thyme, and lots and lots of hot pepper sauce. 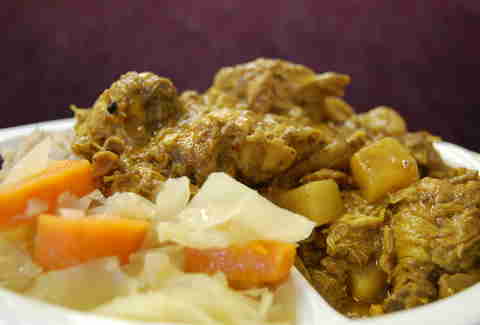 Curry chicken is a pillar of West Indian cuisine and almost every island touts its own special recipe. My Trinidadian family opts for dark-meat chicken rubbed down with "green seasoning" (cilantro, thyme, basil, tarragon, garlic, green onions, rosemary, marjoram, Scotch bonnets), simmered in a thick homemade curry sauce, and drenched in as much fiery pepper sauce as you can possibly handle. We eat ours with a condiment spread fit for a king -- shredded coconut, scallions, diced bacon, apple chunks, mango chutney, salted peanuts, and, of course, even more hot pepper sauce. Callaloo is a super-popular Caribbean side dish of West African descent, made from green, leafy veggies (amaranth, taro, xanthosoma), steamed and seasoned with salt and other spices. Each island has its own take on callaloo, adding okra, coconut, or spinach to the mix. Oxtail is HUGE in the Caribbean -- and for good reason. It's basically a slow-cooked cow tail, as tender and succulent as the day is long. You can find it in soups, curries, stews, and other hearty dishes all over the islands. Is eating shark meat ethically questionable? Maybe, but it tastes downright amazing -- especially when you season it, fry it, and stuff it between two pieces of fried flatbread. 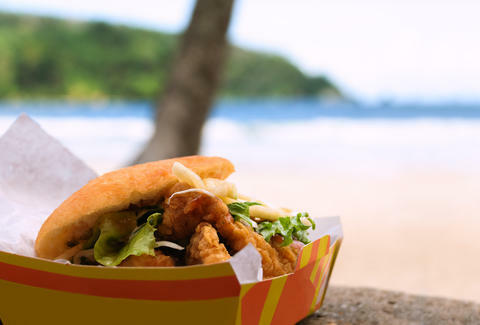 This swordfishy, salty sandwich is a Trini beachside treat you just have to see to believe. Simply put, pastelles are to Trinidad as tamales are to Mexico -- a mixture of Caribbean herbs and spices, raisins, cornmeal, and heavily seasoned meat (or veg), wrapped up burrito-style in a banana leaf and steamed to perfection. And, for some reason, you're supposed to eat them at Christmas time. It's not pretty but it sure is good for you -- except, of course, when it's fried into donuts (which are amazing, by the way). West Indians like adding this starchy, vitamin-rich fruit to a bunch of different dishes, both sweet and savory, and it's even dried and ground to make wheat-free flours. A deep-fried hand pie bursting with seasoned mashed potatoes and green peas, aloo pie is the Caribbean version of an Indian samosa. The appetizer's concept is basically the same throughout the West Indies, but the seasoning and fillings tend to vary slightly from island to island. 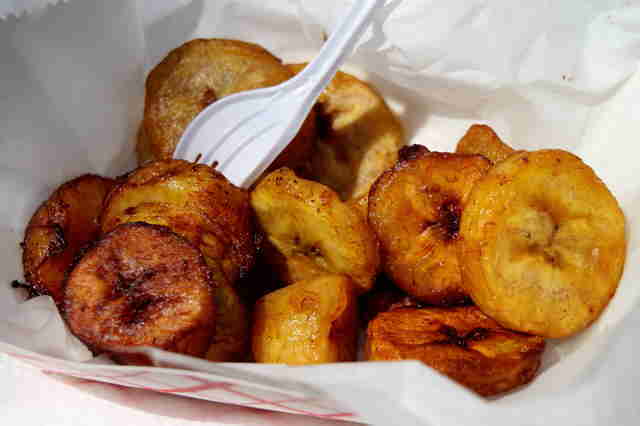 Contrary to popular belief, plantains are not actually bananas, though they do descend from the same family. 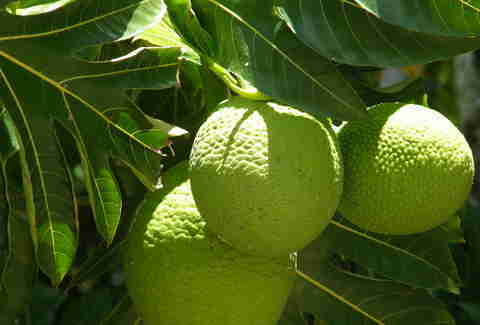 Fried, boiled, or sautéed, this soft, starchy fruit is a constant fixture of many Caribbean dinner tables. True to their name, Jamaican festivals are like little parties for your palate. These fried corn dumplings are the Caribbean's version of Southern hushpuppies -- crunchy on the outside, chewy on the inside, and hit with just the right amount of subtle sweetness. Beef patties are one of the most recognizable Caribbean foods for many of us Yanks, but that doesn't mean they're not damn tasty in their own right. Served piping hot, these buttery, meat- (or veggie) filled flavor bombs are like Hot Pockets that went to Jamaica on spring break, cornrowed their hair, started playing bass in a funk band, and never looked back, mon. Pelau is a rice-based side dish similar to pilaf, with pigeon peas, meat, root vegetables, and, occasionally, bits of cured pork. This is a form of rice and peas (white rice cooked with peas or beans), which is as important to the Caribbean as pasta is to Italy (i.e., it's the foundation for literally everything). Pholourie is Caribbean code for fritters made from chickpea flour and Indian-influenced spices like turmeric, saffron, cumin, chili, and garlic. These little nuggets of deep-fried roadside deliciousness are a Trini speciality that also get some play in nearby Guyana and Suriname and usually come with a side of sweet-and-sour chutney. 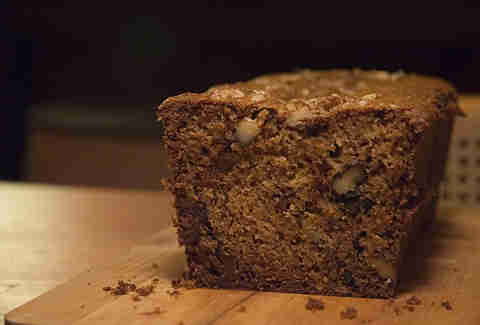 Each spring, my great aunt bakes a jet-black, molasses-infused fruit-and-nut cake, soaks it in dark, spiced rum until it resembles a pirate's liver, and then stashes it away until Christmas, when it becomes everyone's favorite dessert/after-dinner drink. Proceed with caution (and lots of vanilla ice cream). Meredith Heil is a staff writer for Thrillist. Trini gladiator, anti-hesitater, she push the fader from here to Grenada. Lime on @mereditto.